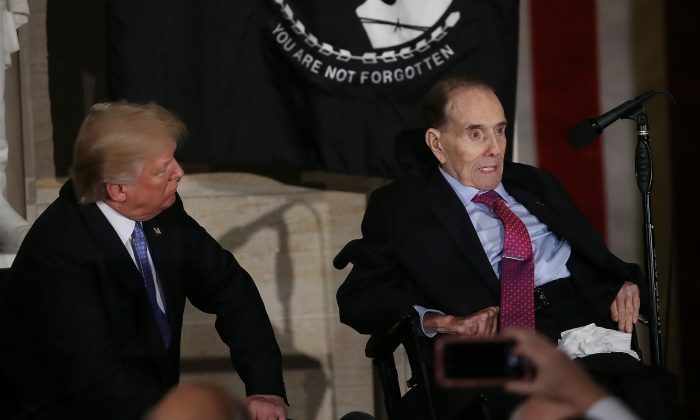 President Donald Trump on April 8 signed into law a bill that authorizes the “honorary appointment” of former Republican Sen. Bob Dole from captain to the grade of colonel, according to the White House. The S. 252 bill passed the House of Representatives unanimously in March after it went through the Senate. The text of the legislation recognizes the time Dole spent in the Army. Dole, who was born July 22, 1923, in Russell, Kansas, enrolled in the Army Enlisted Reserve Corps in 1942 when he was a student at the University of Kansas. He was later called to active duty the following year and served during World War II. Dole, now 95 years old, finished his military service with two Purple Hearts and two awards of the Bronze Star Medal with the “V” device for valor, as well as a number of other awards. “It is certainly humbling to know that my friends in the Kansas delegation, Senators Roberts and Moran and Congressman Marshall, along with General Mark Milley, chose to give me an honorary promotion to the grade of colonel in the U.S. Army,” Dole said in a statement in March, at the time when Congress passed the legislation. During a deployment to Italy when he was in the Army as an infantry lieutenant in the 10th Mountain Division, Dole was seriously wounded in combat and was “twice cited for acts of heroism under fire.” Dole later served in the House of Representatives from 1961 to 1969 and served in the Senate from 1969 until 1996. Trump praised Dole in 2018 as a “great American” during a presentation of the Congressional Gold Medal, according to Fox News. The medal is the highest civilian honor bestowed by Congress. The legislation has no effect on Dole’s pay or other military benefits. The bill was pushed by members of the Kansas House and Senate delegations. “Thank you for your service to America and Kansas @SenatorDole!” the Kansas GOP Twitter account stated on the day the bill was signed. During his time serving in Congress, Dole sponsored and co-sponsored bills in Congress that would improve veterans benefits, improve accountability of missing members of the Armed Forces, and to establish the Persian Gulf War Veterans Health Registry, among others. On April 6, Dole and a number of current senators attended a veterans event in Washington.